Stann Creek District, Belize "Our Belize Vacation" - "Our Belize Vacation"
STANN CREEK DISTRICT-Why consider vacationing in Stann Creek? Stann Creek District is a district in the south east region of Belize, with rhythmic cultures of the Garifuna and Maya. Its capital is the city of Dangriga, formerly known as "Stann Creek Town". Located within the district are the port of Big Creek (the main port of Belize's banana industry), the peninsula and village of Placencia (a popular tourist resort), the villages of Independence, Mango Creek, Mullins River, and the Garifuna village of Hopkins on the Sittee River. The Stann Creek District is also home to the Cockscomb Basin Wildlife Sanctuary. Within the preserve is Victoria Peak, the highest point in Belize, at 1120 meters (3,675 feet) above sea level. Stann comes from "stanns", or safe haven used by the colonists coming from the "old world" to the "new world." For most of the peninsula there is only one road. As the road reaches the end of the peninsula and the village of Placencia, it basically dead-ends at the Shell station and some boat docks. Just before this, a dirt spur turns right just beyond the soccer field and heads for a few hundred yards towards the lagoon. Once you've arrive, your main thoroughfare will hopefully be the beach and the sidewalk, both of which run parallel to each other starting near the docks and heading north. Hotels and resorts are spread along the length of Placencia peninsula. To make it easier to understand where a hotel or resort is, the peninsula is broken up into three broad sections: Maya Beach, Seine Bight, and Placencia Village. Maya Beach is the northernmost section of the peninsula, and the hotels and resorts here are quiet spread out, with few other services or businesses. More or less anchoring the center of the peninsula is the tiny Garifuna Village Seine Bight. Just to the north and south of Seine Bright village are several other isolated resorts. Down at the southern end of the peninsula is Placencia Village itself. Know for its impressive marine reserves and offshore cayes; the inviting tropical rainforest of the world's first jaguar preserve with many species of lush flora and colorful birds; the district also has a diverse selection of tourism attractions and agricultural industries. Arguably Belize's best kept secret, Stann Creek, the country's second smallest district, offers unlimited possibilities for the adventure traveler. Driving from Belmopan, the picturesque Hummingbird Highway winds its way through the Maya Mountains and into the Stan Creek Valley through rustic rual and communities and the vast expanses of citrus orchards. The turnoff onto the Southern Highway presents new vistas of sprawling coastal plain lined by banana plantations, with the Maya mountains to the west and the Caribbean Sea just over the eastern horizon. The view by air is spectacular, over coastal lagoons and the Gales Point peninsula, low-lying karst hills and uninhabited beaches. Via this route, the first in a series of coastal communities is the district's largest in a series of coastal communities is the district's largest town, Dangriga, followed by the upcoming vistor destinations of Hopkins, Maya Beach, Seine Bight and Placencia. Offshore lies dozen of white sand and mangrove studded islands, from those that sit a short distance offshore like Laughingbird Caye to Tobacco Caye and South Water Caye that sit right atop the barrier reef. Then, extending some 22 miles east of the barrier reef is Glovers Reef Atoll one of the 4 atolls in the Caribbean. This area encompasses bird sanctuaries for the magnificent Frigate Bird and Brown Booby and two of Belize's spectacular marine reserves, South Water Caye Marine Reserve and Glovers Reef National Park, both UNESCO World Heritage Sites. The coral formations in a variety of patch reefs, drop offs, sheer walls and mangrove bays are home to abundant marine life including scores of fish species, anemone, gorgonian, coral sponges, turtles, eagle rays and dolphins. Between February and May, an unrivaled experience is to snorkel or dive with the gentle whale sharks as they feed on the eggs of thousands of groupers gathered near Gladden's Spit to spawn during the full moon. Snorkel, dive fly fish, drop fish or deep sea trawl as you explore this marine paradise with local tour operators or in a chartered catamaran. Belize is home to the world's first jaguar Preserve (est. 1990) resulting from a study of majestic creatures in the Cockscomb Basin WIldlife Sanctuary. This 160 square mile reserve is home to all five species of cats native to Belize, including the jaguar, puma, ocelot, margay, and jaguarundi. Managed by the Belize Audubon Society, the Sanctuary features an extensive nature trail system leading to crystalline waterfalls, impressive kaway swamps, and a healthy population of smaller mammals and amphibians, insects and over 290 species of birds. The Cockscomb Basin Wildlife Sanctuary is rimmed by the Maya mountains and Victoria Peak, which is 3,675 feet high, is scalable and noted as the second highest peak in Belize. In close proximity to the jaguar reserve is the Maya community of Red Bank, known for the annual visits of the rare and brilliantly colored Scarlet Macaw which come to feed on the annatto and pole wood fruits near the village. Another fine example of rainforest habitat can be found in the Mayflower Bocawina National Park with its trail of waterfalls and the unexcavated remnants of an ancient Maya community. Belize is know for its diversity of cultures and the Stann Creek district offers living examples of two colorful and distinct local cultures. On November 19, 1932, the Garifuna people arrived on the southern coast of Belize and each year there is a national holiday and reenactment of the first landing. Descendants of escaped African slaves and the Carib Indians of South America, UNESCO has declared the Garifuna Culture "a masterpiece of oral and intangible heritage" in recognition of the history, language, and vibrant cultural traditions. Drumming, dancing and exotic dishes of the Garifun culture can be found in several communities including Dangriga, Hopkins, Seine Bight and Georgetown. Along the southern highway and sideroads, the Stann Creek district is dotted with Kek'chi and Mopan Maya communities. Integrated into the Belizean lifestyle, much of the traditional culture has been retained, from the subsistence farming of corn and beans via the milpan system; intricately embroidered blouses and colorful skirts to the thatched housing and indoor fire hearths for baking fresh ground corn tortillas. Powerful herbal combinations for healing and well-being and the chimes of marimba music are additional evidence that the vibrant Maya heritage lives and thrives here. HOPKINS - The seaside village of Hopkins, once a sleepy Garifuna fishing village has become a popular viistor attraction with lively local and businesses at the village center leading to upscale resorts and dive operations along the golden sand beaches to the north and south. DANGRIGA - Affectionately dubbed the Culture Capital of Belize for the predominately Garifuna culture of its residents, local artists and drummakers and the oft heard sound of drumming Garifuna Gulusi Museum, the laid back town of Dangriga (pop 12,000) is the municipal center of the district with headquarters fro all government offices and the Dangriga airstrip The south Stann Creek River or Gumagarugu river (meaning sweet water) runs through the town, its banks near the mouth of the river, home to a colorful market and pier to catch a boat to the offshore cayes and reef. The long awaited cultural attraction is located on the outskirts of Dangriga and offers an interactive history lesson on the proud Garinugu (Garifuna) people. Sitting right atop Belie's Barrier Reef, Tobacco Caye can be as much a social gathering of world travelers as it can an isolated island experience, depending on the time of year. This village is one an ultra-tranquil stretch of beach and can serve as a mellow base for canoeing, diving, sailing, windsurfing, fishing, and other trips - or for just doing nothing on the beach. In Belize's lowkey tourist hangout, Placenaia, check out the world's narrowest street - its 4,071 feet long and four feet wide. Walking its length offers ample opportunities for shopping, eating, and getting a sense of village life. Palmss, sand, snorkeling, and sun are found at this national park, part of a 10,000 acre protected marine area. GO for a nature hike and river float in this extensive reserve, famous for its multitude of birds, jacquar tracks, and other jungle critters. Stay overnight or do it as a day trip from anywhere in the area. Dangriga, which means "sweet water" in the Garifuna language, was originally called Stann Creek, and you may still hear it referred to as such. The name Stann Creek comes from the Creole version of "Standing Creek", a description of the river's slow-moving waters. As the capital of the Stann Creek District, which is one of the main citrus growing regions of Belize, Dangriga is an important and vibrant agricultural and fishing community. However, despite its size and almost urban feel, it lacks the seaminess that characterizes Belize City. The town fronts right on the Caribbean and has several water front parks, which are surrounded by simple yet attractive residential neighborhoods. Still, Dangriga is of little interest to travelers. There aren't any good beaches, and the town can feel stiflingly hot and desolate on most days. Most travelers head farther south to either Hopkings Village, Placencia, or Punta Gorda, or out to one of the nearby offshore cayes. Dangriga is the main maritime transportation hub for trips out to Tobacco Caye, South Water Caye, and Glover's Reef Atoll. Dangria is the largest city in southern Belize and the seat of the country's Garifuna culture. The Garifunas are a proud and independent people, who have managed to maintain their unique language and culture, which dates to the 16th century intermingling of free Africans and Carib Indians. The only time Dangriga becomes a major tourist attraction is around Garifuna Settlement Day. The main activity in Dangriga is a slow walk up and down the main north-south thoroughfare. If you tire of watching the endless procession of people and listening to the colorful mix of English, Creole, and Garifuna, head a block or two over towards the sea and cop a seat in one of the town's oceanfront parks. If you're looking for a more active adventure, you'll have to head out of Dangriga, but your options are plentiful. The only true attraction in the area is the quaint little Gulisi Garinfuna Museum. Although small, this is worth a visit. Spread around several rooms here you'll find interpretive displays of Garifuna history, culture, and daily life. Three separate documentaries are shown continually on televisions in the different rooms. There's a gift shop here, as well as paintings by prominent Garifuna artists like Benjamin Nicholas and Pen Cayetano. The museum is located 1 mile west of town, on the road out to the Hummingbird Highway. It is open Monday through Friday from 10 a.m. to 5 p.m. and Saturday from 8 a.m. till noon. If you're staying in Dangriga for any period of time, you may also want to visit any number of the relatively nearby attractions, including Guanacaste National Park, Blue Hole National Park, Cave Branch, Hopkins Village, and Cockscomb Basin Wildlife Sanctuary. The fishing is excellent out of Dangriga. Most folks head to the flats in search of bonefish, permit, and tarpon. Closer to shore and near the river mouth you can find snook, and beyon the barrier reef lie marlin, sailfish, tuna, wahoo, and dorado. Dangriga is the jumping-off point for some wonderful small cayes situated right on the edge of the barrier reef, as well as Glover's Reef Atoll. Most of the hotels in the town can arrange for a day trip of snorkeling or scuba diving at Tobacco Cyae, South Water Cyae, or one of the cayes comprising Glover's Reef Atoll. Located just off the highway in the tiny settlement of Pomona Village, is one of the most important and renowned factories in all of Belize, Marie Sharp's. The factory is small and simple, and depending on the time of year and demand, they may be making any number of their various hot sauces, jams, and chutneys. If you're lucky, you'll get to meet Marie herself. The tour is free, but you'll want to bring some money to stock up on the sauces. We rate them as being some of the best sauces in the entire country. Tucked a few miles off the highway is Five Blue Lake National Park. The main feature of this park is a large cenote, whose various hues of blue originally gave the part its name. However, in July of 2006, the cenote suddenly and rather inexplicably drained almost completely. By early 2008, the lake had recovered about 75% of its original level, and much of its former beauty. All around the park are forested lands and distinct karst hill formations, with a series of trails leading through them. The park is run by the folks from the local community of Saint Margaret's Village. The park and small village are located on Lagoon Road, just off the Hummingbird Highway around Mile Marker 32. There are about 3 miles of well marked trails in the park. You can also take a refreshing dip in the lake, or rent a canoe for a leisurely paddle. Gales Point is a small Creole fishing village about 25 miles north of Dangriga. It is a peaceful village where you can get in tune with one of Belize's traditional cultures and its slower pace of life. The village stretches along a narrow peninsula that juts into the large brackish Southern Lagoon, because the manatee that inhabit the water of the lagoon bring most people to Gales Point in the first place. You can hire a small boat to take you out to where the manatees usually feed. The boats generally will hold up to eight people, so the more peoples you can line up, the less it will cost each of you. You can also ask around in the village about renting a canoe to paddle yourself out to where the manatee fee. I prefer this option, although be sure to get a lightweight modern canoe, as the traditional carved tree-trunk dugout canoes are a bear to paddle. Although once encouraged, swimming with the manatees is no longer allowed. The contact is potentially dangerous for manatees and humans alike, and it's best to just enjoy a pleasant sighting of these gentle water mammals. In addition to the manatees, this is a fabulous bird-watching spot, and if you're lucky you might even see a jabiru stork here. There's not much happening in Dangriga after dark. Your best bet would be to see what's happening at the Pelican Beach Resort. Each year on November 19, Garifuna Settlement Day is celebrated in Dangriga, with Garifunas coming from around Belize and as far away as Guatemala, Honduras, Nicaragua, and New York. The celebration is a riot of street music and colorful parades. Eating, drinking, and dancing go on well into the night. 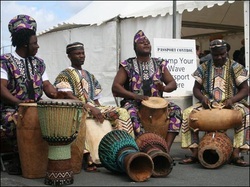 The Garifuna have their own traditional music, which is based on wooden drums and choral singing. The rhythms and songs have strong African roots, and have given birth to a hubrid pop music called Punta Rock, which is probably the country's most popular music and dance form. If you plan to partake in the festivities, be sure to book far in advance, as every hotel room in Dangriga and the nearby towns and villages sells out early. For more information contact National Garifuna Council of Belize. Garifuna Settlement Day isn't the only opportunity to experience the full color and vitality of traditional Garifuna culture. At the end of the Christmas and New Year season, on the weekend closet to January 6, the local Garifuna community takes to the streets to enjoy the Wanaragua or John Kunnu dancers. Wearing, masks, elaborate costumes, colorful headdresses topped with macaw feathers, and vibrating arrangements of shells and vedas, Wanaragua or John Kunnu dance troupes parade through the streets of Dangriga, accompanied by the beat of traditional drummers.